By extending the ball joint on the front lower control arm, the Buddy Club P1 Racing Ball Joint raises the roll center and brings it closer to the center of gravity, thus increasing the vehicle's roll stiffness and eliminating any unwanted side effects to the vehicle's suspension geometry. The ball joint dust boots are sturdy and snug and will withstand heat and the rigors of racing much better than your factory dust boots. The included castle nuts are strong and will not strip. 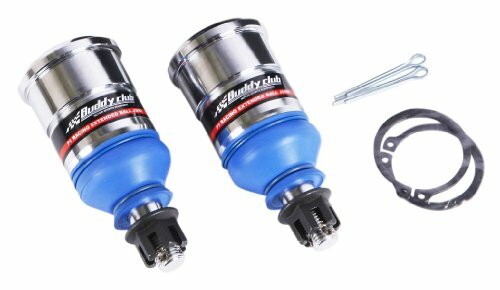 The Buddy Club P1 Racing extended ball joints help return the suspension geometry to its ideal position while still allowing you to lower your car's center of gravity. Furthermore, they maximize vehicle tire grip by allowing increased front camber adjustability.